It’s hard to watch sometimes – the way they can be when they face frustration and disappointment and unmet expectations. They’re old enough now that they don’t throw themselves on the floor and scream and have tantrums in public places but it’s still not pretty when they get this way. No, sadly, I am not talking about the boys. 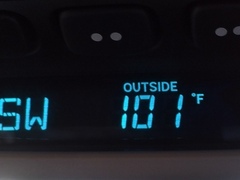 The van gauge shows it’s 101 degrees; the bank says 105. We arrive in Annapolis expecting to get all sorts of work done on the boat (e.g., reconnecting the new engine to the fridge, fixing issues with the batteries, etc.). Few contractors return our calls and the ones who do don’t show up. I’m not sure exactly what led to the tantrums. It was probably a combination of the perceived lack of progress, the 100-degree heat (which made it at least 105 on the boat, completely liquefying my chocolate stash), meeting other boaters who did in one year what we had planned to do (Europe, Greece, the Caribbean), daily lugging of 30 pounds of ice to keep the food cold, marina washers and dryers that don’t always work, and generally missing the space and comforts of a home. We committed for one year and just re-upped for a second, perhaps forgetting the small but crucial detail that it meant living on a boat for another year. Harsh phrases were thrown about, threats were made (“end the damn trip” “so done with this”), colorful language was used and there was a general sense of adults behaving badly. But tantrums are like squalls. They seem to come out of nowhere and surprise you but they pass quickly and there is a return to calmer waters. When it seems like superficial stuff is the issue, you know it’s something deeper. It’s been almost exactly one year that we’ve been on the boat. We are back in Annapolis which is where we started from. In that year, we made it down to Florida. Some of the angst is recognizing (again) that we didn’t do what we set out to do. How pathetic would it be if the trip ended and we blew most of our savings to buy a boat and only ended up in FL? As I said to Matt, we could have done that in one day with four fairly inexpensive plane tickets and a helluva lot less time, tension and cash. Hence, the decision to extend the trip for a second year. Maybe the trip issue reflects the larger, unspoken one. What if we don’t change the trip? What if we are the same people we started out as? Only time will tell. In the meantime, we decide to just enjoy the rest of our time in Annapolis. Cheers to Year 2! PS. And it’s not as if nothing got done on the boat. Matt put in a water filter which means we no longer have to re-fill gallon drinking jugs at water fountains. He also put a grill on the back of the boat so we can cook without heating up the inside of the boat – two huge improvements in terms of making life a bit nicer. This entry was posted in Uncategorized on July 13, 2014 by Diane.